Battery cable also refere to as automotive battery cable are used in automotives, tractors and freight trucks. Battery cable usually refers to automotive battery cable and refers to the large gauge (thicker) wires used in automotives, from small cars to tractors and freight trucks. Typically, battery cable is used to supply power from the battery to the starter engine or as a connection to ground (i.e. the car frame). Battery cable can also be used to connect the battery to other electrical components (e.g. fans, A/C, lights, etc. ), though smaller gauge automotive wire may work instead. 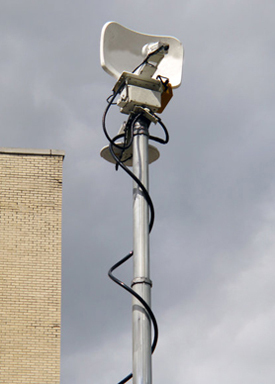 Some electrical power systems also use battery cables as the connections between battery banks, inverters, and solar panels in solar power installations. However, for applications that are not under the hood, most people prefer welding cable, since it is more flexible, durable, and can handle more current. Battery cable may range in size from 4/0 to 6 AWG. 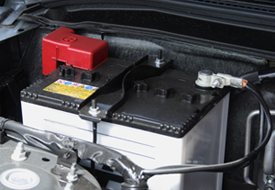 The conductor material for car battery cables is typically stranded copper wire to provide some flexibility and is made for use as connections between automotive batteries and other units that draw high amounts of current. Therefore, they need to be able to handle the amps that will be drawn and primarily need protection against heat, oil, and battery acid. Depending on the insulation, some battery cable will have extra protection against cuts, tears, and abrasions from rubbing against machine parts. Wire gauge is simply a number that refers to the cross-sectional area of the conductor and does not include the thickness of the insulation. Thicker wires have smaller gauge numbers. For example, a 5 AWG wire is much thicker than a 32 AWG wire. There are several different gauge standards depending on the country or industry you are in, and the American Wire Gauge (AWG) is most commonly used for electrical wires in the U.S.
For solid wires, there will just be one number for the gauge rating. For stranded wires, you will see two or three numbers. A 6 AWG 259/30 stranded cable means its total cross-sectional area is rated at 6 AWG, and it has 259 wire strands that are each rated at 30 AWG. Cross-sectional area of a cable is important because it determines how much space there is in the conductor for electrical charges to pass through. Thus, wire gauge is one of the factors that determine how much amps a cable can safely conduct: the thicker (more cross-sectional area) the wire the more current it can carry. What makes battery cable different from other cable? What sets battery cable apart from other cable is primarily its higher temperature ratings (up to 125°C) and its resistance to oil and battery acid. The most common types of battery cable are SGT (Starter or ground, thermoplastic), SGX (Starter or ground, cross-linked polyethylene), and STX (Starter or ground, thin wall, cross-linked). 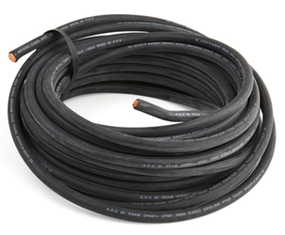 For a comparison, welding cable typically is rated for 90 or 105°C (Neoprene or EPDM insulation respectively). Furthermore, all battery cables are oil proof, while welding cable tends to soak up oil and grease if not kept clean or wiped down. This is because the two most common insulation materials for welding cable are EPDM and Neoprene rubber, both of which provide great durability and flexibility but do poorly against oil and various other chemicals that may soak into the material. PVC insulated welding cable will have good protection against oil. There are other types of cable that are more flexible and resistant to physical damage. For example, both welding and entertainment/stage lighting cable are more flexible than battery cable and can handle more current (also referred to as ampacity or simply amps). Welding cable is especially tough, as it is made for use in welding applications where sparks, scraps of metal, and heavy machinery can easily damage less sturdy cable. Battery cables are used in satellite communication vehicle and news van. 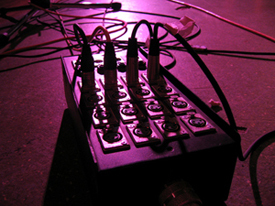 Stage lightings and sound systems. Automotive battery, power inverter, amplifier and other electronic components.